Bright Starts preditiction this season.....all the girls will be in Pink! We agree. In our book, the color pink is always in but the Pretty in Pink Collection from Bright Starts puts a fresh, fun spin on being girly. The colors, patterns, and sweet characters make this adorable gear a must have for any chic little babe. Inspired by current trends, the Pretty in Pink Collection is filled with fabulous products for baby girl. Don't feel guilty when you become addicted to this collection and feel the need to buy it all - a portion of the proceeds support breast cancer research and awareness giving little girls of today a brighter tomorrow. To learn more about Bright Starts Pink Power Mom program visit www.pinkpowermom.com. In the meantime, here is a sprinkling of the Pretty in Pink products that truly are a must-have. (1) Tummy time has never been so fun with the Tummy Cruiser Prop & Play Mat ($24.99) that encourages healthy tummy time play and exercise. (2) Baby's PlayPlace ($79.99) gives your gal endless ways to play in a safe environment for a variety of stages and a ton of great features. (3) The Bloom & Rattle ($4.99) and Bloomin' Blocks ($10.99) are almost too cute to play with -- they are sure to put a smile on your little one's face and make them happily content for hours of fun. (4) Need the perfect throne for your little princess? We suggest the soft plush Melodies Bouncer ($32.99) in the adorable sugar blossom pattern. (5) Your little gal will jump for joy with the Pretty in Pink Jumper ($79.99). An award winner - the unique platform has nine fun features and a seat that spins 360 degrees. (6) Another great way for tummy time play is the Bloom & Play Activity Gym ($49.99) with lots of room and ways to play not just on their tummy - also laying and sitting on this comfy, soft mat. We love the 8 fun links included for attaching your little one's favorite toys and the oversized flower shaped mirror for self-discovery. 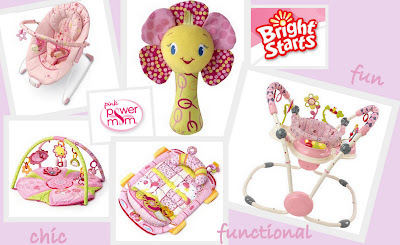 Whatever you need, Bright Starts has endless gear and fun toys (that look cute too!) to make your baby's play place just as perfect as they are. Don't forget to become a fan on Facebook too! This is a great collection of gear - especially for those with girls! I have 1 and twins on the way! Can't wait to add these great products to my registry! Thanks Cupcake!